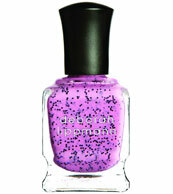 Shop Deborah Lippmann nail lacquers here! Glitzy pastels are all the rage this spring season judging upon our new arrivals from Deborah Lippmann's Staccato Collection. This new trio combines black glitter with traditional soft pastel hues for an interesting juxtaposition. Inspired by some of the most popular ice cream's and childhood favorite, cotton candy! The pastels we've seen come across our desks have had more of a matte finish so it's nice to have an edgier option with a little more pizazz! From left to right: I'm Not Edible (panicked pink staccato), Polka Dots And Moonbeams (sprightly black and white staccato), and Rockin' Robin in mint staccato.